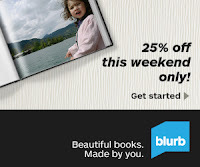 Cheap Mama Chick: 25% off Photo Book Purchases from Blurb! 25% off Photo Book Purchases from Blurb! I am totally in love with making Blurb books for just about every occasion, whether it be a wedding book, a birthday album, a cookbook, family trip pictures, even my Instagram account can be converted into a Blurb book! I have been meaning to make a new book for a while and as if Blurb read my mind, they are offering 25% off purchases from 2/22-2/25. Head over to Blurb now and tap into your creative side! This weekend only- Blurb Flash Sale| 2/22/13-2/25/13 | Discount Code: FLASH25OFF from Blurb here! Personalized Books for your children at I SEE M. Get Much Discount!